A member who is celebrating his or her birthday or anniversary is asked to roll the stone. The stone is a 4" cube with different penalties inscribed such as, you and your left pay or you pay double etc. 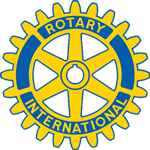 The small funds raised in this manner go toward the Rotary Foundation. Our members work very well together on whatever project we may decide to tackle and we have a lot of fun doing it. We are always open to having new members join us and if you are interested please contact us by sending an e-mail by clicking on membership chair's name on the home page. We look forward to hearing from you.